[Florian] sent a link to his proof of concept in creating a multitouch display using the Kinect. He’s the one behind the libTISCH multitouch package and that’s what he used to get this working along with the recently released Kinect drivers. He did this on an Ubuntu machine and, although it’s not a turnkey solution he was kind enough to share some rough directions on accomplishing it yourself. Join us after the break for his instructions and some embedded video. Your results may vary so please leave any tips you have on getting this up and running in the comments below. The kinect is a 3d scanner, a 4d scanner in fact! This looks great, but couldn’t openCV be used to create an interface like this? Don’t get me wrong, I appreciate anyone sticking it up bill, but to use this interface we still gotta give Micro$oft our bucks for the Kinect. @Cyberteque I was just thinking that. You could use light pens and a projector/big tv to get a similar effect. But, other than that, this is a great use for the newly hacked device. this is a good hack no matter how much overkill it is. Anyone followed the instructions and got it to work ? M$ kinect is a spy tool at M$ disposial, in half the worlds homes…………… hmmmmm…..
Error: unknown camera type requested. I tried modifying the settings file as specified, but so far no luck same message, I will try to reach out to Florian possibly tomorrow if I can’t get this to work out and see if he can offer any advice. Hmm okay finally got it running I just commented out the section where it’s checking for the camera type against a constant, not sure why that wasn’t coming through as true but creating the KinectImageSource without doing the check worked out okay. Ultimately I also had to run sudo -s before doing the export for LD_LIBRARY_PATH and ultimately for running ./touchd -Vf I believe due to the fact that the underlying libfreenect.so needs access to the USB port. The only other thing to note that I left out earlier was that the LDFLAGS assignment was a bit wrong I had to add /build into mine to get it to a path where it could resolve everything. So far just lots of random spots being detected I’m not sure exactly how this is supposed to work in the first place though so I’ll have to do some more digging around. Giving up for the late late night and will give it all another crack tomorrow, if I don’t get this going by then I may abandon ship and start looking into porting marcan’s work into Java as I’m more comfortable there and then start looking into using inverse kinematics to solve arms/legs (assuming I can pretty easily detect the torso and from there find the extremities to the hands and feet although I’m sure this is no easy task). Either way thanks for putting this out there super excited about all of this, I really feel the system could be better if a room were just rigged with a few camera’s in the corners rather than a couple bunched together in one spot but for what it is this is pretty sweet. Florian mentioned that it’s most likely that lib/simplecv does not contain KinectImageSource.o, which is true in my case. I follow the instructions above to the letter from above, and it compiled fine. I am not seeing any indication during make of it even attempting to compile KinectImageSource. I will investigate further and report back. Can Micro$oft still spy on you with the kinect? This might be a stupid question, but how do you connect the actual kinect to your computer? I also tried what Shaun talked about and removed all the checks against constants from camera.cc but still no joy. I look forward to have TISC working on my box with Kinect. Anyone figure out the open(/dev/video0): No such file or director issue. I am trying to get this to run, using the directions above, however it seems no matter what I do running touchd shows the “open(/dev/video0): No such file or directory” error. In my case lib/simplecv does contain the KinectImageSource.o file. 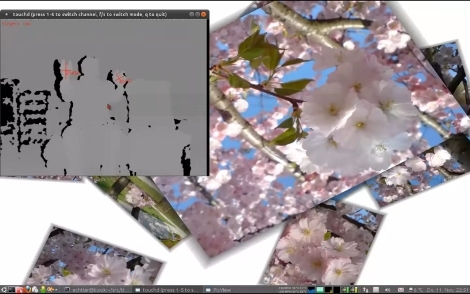 Not a noob to Linux but a semi-noob to compiling, I can’t seem to get tisch installed properly with Kinect support. ; I continue on anyways because glview seems to work fine afterwards. 2) I also don’t get what the cflags and ldflags are referring to; my openkinect source is in ~/libfreenect, but there is no c/lib folder? 3) Compiling anyways without those flags and running touchd -Vf just gives me a b&w webcam feed from my laptop’s built-in webcam. 4) Finally, no ~/.tisch.touchd config file is created automatically; I assume I have to create it myself? If anyone can post a step-by-step install of what they did to get this working, I’d be extremely grateful for any help! the trick to getting it to connect is to get a cable from microsoft that is used with older XBoxs. It’s not that noobish a question because it is a little difficult to find the information or the part.